Difficulty with writing can have an impact on self-esteem, anxiety, behaviour and all aspects of the curriculum. It can relate solely to the physical act of handwriting, but frequently also involves composing the content, structuring the logical progression of ideas and just getting started! Resistance to writing has a tendency to turn into a behaviour issue in school and a disruptive influence in the home. It can become a negative attitude to school and all that it stands for. If this seems to be the most troubling worry, it should be solved. 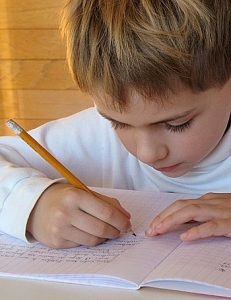 We do not help a child with a handwriting problem by doing more writing! We use some highly active exercises that don’t appear to have anything to do with it! They work on the underlying developmental influences. So if your child’s homework is a nightmare for you, help them to sort out their nightmare.